Governor Dannel P. Malloy, joined by Interim Commissioner of Education Dianna R. Wentzell, today announced that graduation rates continue to climb as persistent graduation gaps continue to close. In 2014, the statewide graduation rate increased 1.5 points to 87.0 percent—up for a total 5.2 points since 2010. Thank you for your interest in the Code.org elementary curriculum (http://studio.code.org/). Please bring a laptop and charger with you to the workshop! Lunch and light breakfast will be provided. A swag bag will also be provided. Join us to bring great activities to your classroom. Registration begins at 8:30am. As conference chairman, I am proud to welcome you to the 77th Annual New England Association of Technology Teachers Conference being held at Johnson and Wales University in Providence, Rhode Island on November 14th & 15th. 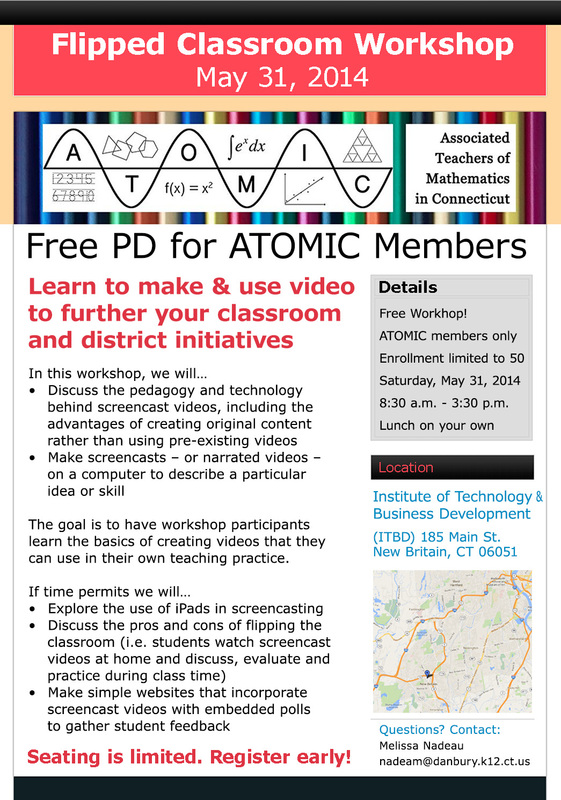 This year we are inviting Science and Math Teachers to join us. With that in mind the Conference Committee is offering a wide variety of STEM related workshops that will be helpful and interesting for all. The conference theme, "TECHNOLOGY AND ENGINEERING - BRINGING THE SKILLS TO SCIENCE AND MATH (STEM)", dictates that the committee offers a variety of workshops and activities that will be helpful and informative to all Science, Math and Technology teachers elementary to high school. After attending the NEATT conference you will return to your classroom with a renewed vision of STEM for your students. Our keynote speaker started his career as an industrial arts teacher, Mr. Fay Butler, is the owner of Fay Butler Fab/Metal Shaping in Wheelwright Massachusetts. He is dedicated to the education of craftsmen through material science. One of his areas of expertise is the subject of creating compound curves through stretching and shrinking of metal. Fay uses the science behind the material and breaks this procedure down to the atomic level. He is a huge advocate of Technology, Math, and Science education, serving the aircraft, automotive, architectural, and art industries from early development concepts to reproduction of production parts. We are sure you will enjoy his remarks. Johnson and Wales University and the great city of Providence have a lot to offer and hopefully you will make time to enjoy the historical architecture, museums, theaters, as well as the Providence Place Mall and Waterplace Park. Providence is known for its excellent restaurants and dining experiences, many located in the Federal Hill section of Providence and not far from the JWU campus. I would like to thank Mr. Gerry Florio and my committee for all their help, without some assistance, this could not happen. We would like to talk with teachers interested in helping develop model news literacy lesson plans for math in grades 4 - 12. Teachers selected for the project will be compensated $3,000 each. The project is coordinated by the American Society of News Editors and the Journalism Education Association, and funded with a grant from the Robert R. McCormick Foundation. Interested teachers would be provided with news literacy lesson plans and activities that could be modified and adapted for the math classroom or the teachers could create original lesson plans. Through this process, we hope to learn how math teachers view news literacy. We are also working on similar projects with national organizations and teachers in social studies, language arts and science. What is news and information literacy? Simply put, it is the ability to use critical thinking skills to judge the reliability and credibility of news reports and information sources. In the information age, more data is produced in a single second than can possibly be consumed in a lifetime so the need for news and information literacy has never been more important. Research suggests that students who develop news and information literacy skills become more active and engaged citizens. Many schools across the nation already teach news literacy and more research on the impact of these efforts is underway. One way to approach news literacy is with the REALLY technique developed by Al Tompkins of the Poynter Institute. Is this REALLY the story? Is this REALLY the whole story? Is this REALLY physically possible? Is this REALLY what I need to know? What do my readers and listeners REALLY want to know? This approach uses five questions to focus on this intersection of skepticism, curiosity, openness, reporting, critical thinking and knowledge. 2. Can I trust the source? 3. Is that person biased on this subject? 4. Am I biased on this subject? 5. Where can I get reliable information to help me frame my opinion? Interested teachers should email Le Anne Wiseman at Lwiseman@asne.org or call 573-884-2689 for more information. Take the Dow Teacher Challenge! The Center for Science Teaching and Learning (CSTL) and Dow have come together to support STEM education in our schools. STEM education is absolutely vital for our children and our future. We need to encourage children to pursue science, technology, engineering and math related fields. Our real challenge lies in how to achieve our goal of improving STEM education. Teachers of all fields are invited to submit their ideas for increasing STEM education in the classroom. The top 25 entries will earn a $1,000 grant to be used in the classroom! Visit www.dow.com/education to submit an entry. The deadline for all Summer Teacher Challenge submissions is July 30, 2014. The Fall Teacher Challenge will begin on August 4, 2014 and the deadline for all submissions is October 31, 2014. The top 50 entries will earn a $1,000 grant. Together we can build a STEM-strong future! We have become aware that an organization called Snapwiz is marketing a formative assessment product called Edulastic that claims the following: “teachers can create standards-aligned formative assessments with interactive, free-form questions defined by Smarter Balanced and PARCC.” This product has no relationship to Smarter Balanced. Snapwiz did not seek permission to use the Smarter Balanced name. Further, Smarter Balanced does not endorse Snapwiz or its products. Please send this message to your districts, schools, and other concerned stakeholders so that we can minimize any confusion resulting from this marketing campaign. Continuing its tradition of mathematics education leadership, NCTM has released Principles to Actions: Ensuring Mathematical Success for All to define the principles and actions that are essential for a high-quality mathematics education for all students. This new landmark publication builds on NCTM’s Principles and Standards for School Mathematics and the Council’s previous standards publications, and it supports implementation of the Common Core. 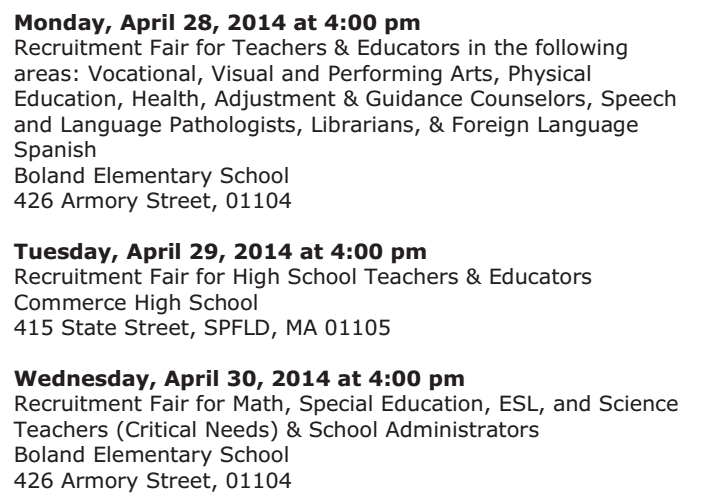 Visit us at www.sps.springfield.ma.us to learn more about the Springfield Public Schools. Stamford Public Schools is hosting a STEMfest in Mill River Park in Stamford on April 26th from 10am-4pm.